Full of Grace and Truth: "If you desire, you can be all aflame!" "Lot was a great Egyptian ascetic and a contemporary of St. Arsenius the Great and St. Agathon. He lived a life of asceticism in his monastery near a lake at the town of Arsinoe, and directed many brethren on the path to salvation. His close friend and advisor was Abba Joseph. Lot once said to Joseph: ``Abba, I fast as much as I can, hold fast to prayer, keep silence and contemplate, and also, through abstinence, guard myself from impure thoughts. Therefore, what else can I do?'' The elder stood up, raised his hands to heaven, and his ten fingers shone like ten flaming candles. He then replied: ``If you desire, you can be all aflame!'' Having pleased God and set many on the path to salvation, St. Lot entered peacefully into rest in the fifth century." 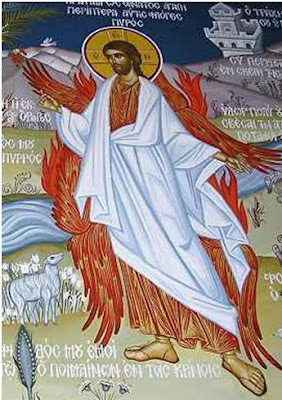 May we be able to have a modicum of this zeal and grace of the Holy Spirit, and I think as St. Seraphim of Sarov said, seeking Him should become for us the primary goal of our lives (though I haven't even begun to struggle against my sins).